First to go under the magnifying glass is the Diamond Tech Craft G2 Bottle Cutter, or G2 for short. For such a simple contraption, its assembly was not very intuitive. I would describe it as 'fussy.' By far, it took the longest to assemble of all of our competitors. 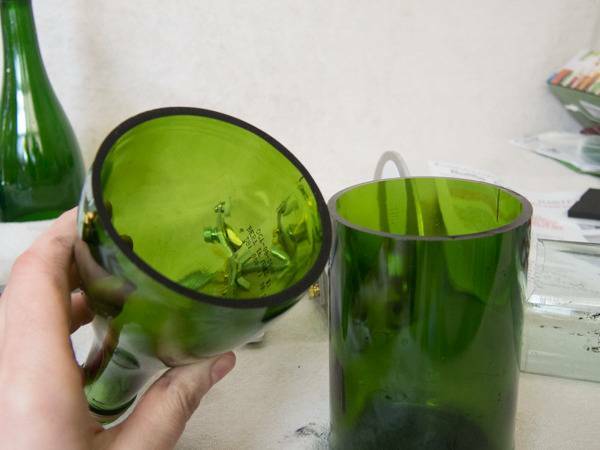 Besides the individual pieces, the G2 came with a 'clinker' to insert inside bottles to help their separation by 'tapping' them. This is not something I'd recommend, even with a tapper on hand! It also came with 2 pieces of emery cloth and one cutting head. Setting it up to score was easier than I thought it was going to be. 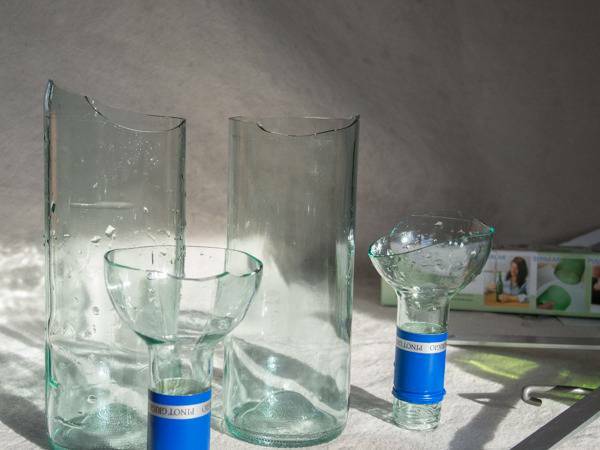 All it took was a few adjustments of the upper arm and lower arm to get the device perpendicular to the bottle, which is imperative to get a proper score. I used the hot then cold water bath means of separation, which the instructions for the G2 recommends, and it was a huge fail. Would the 3rd time, with a different type of bottle, be the charm? Nope. In this case multiple hot/cold baths didn't separate the bottle, so I tried the candle flame/cold water method. Still no separation. Again, I got a nice cut, and a nearly successful separation. At this point, it was time to move on to our next competitor. 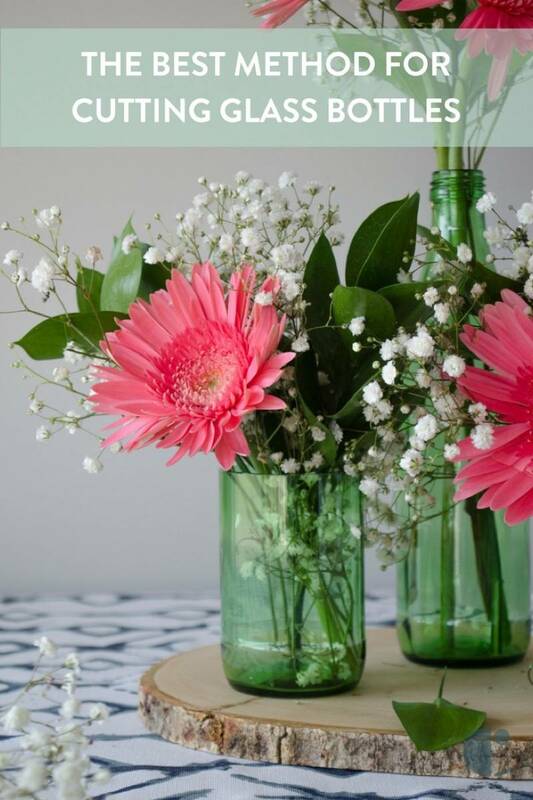 Check out Bottle Art: Dazzling Craft Projects from Upcycled Glass for great bottle cutting project ideas! What impressed me about it was its solid construction. Steel threaded rod, wing nuts, and hex nuts; 1/8 aluminum brackets; rubber feet, and nylon (or possibly UHMW) rollers all added up to a hefty unit. Also, the cutting head on the Bindu has 6 (!) numbered cutting wheels, so you can keep track of which ones you've used when the old one gets dull. Setting up the Bindu for scoring was a no-brainer. 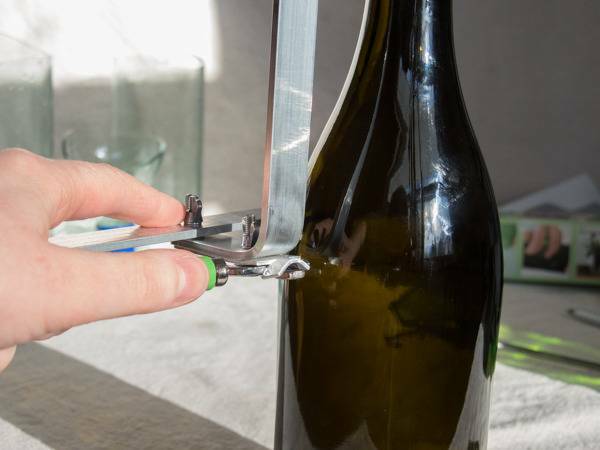 Just adjust the bracket with the cutting wheel to the length at which you want to cut your bottle and away you go. Separation with candle/cold water, as suggested by Bindu's instructions, wasn't a total failure, but it wasn't good either. My second attempt was pure perfection (below). As for cutting on a slant like the G2, Bindu's instructions imply that it may be done if you shim the cutting wheel/turret with washers. 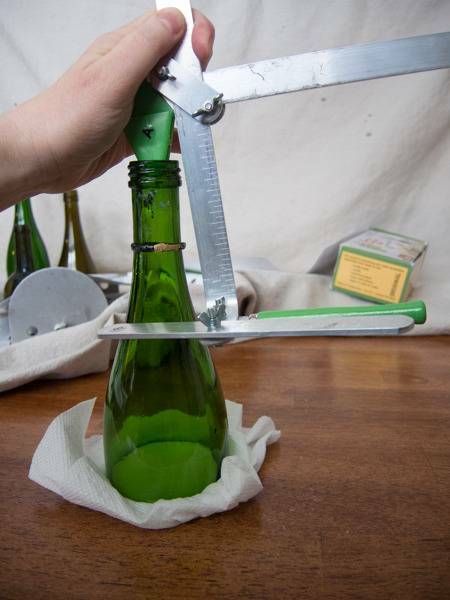 The idea is to adjust the angle of the cutting wheel to match the slope of the bottle. Not only does it sound tricky, it sounds like another post! Which is why we're going to quit while we're ahead with the Bindu and go on to our next contender. 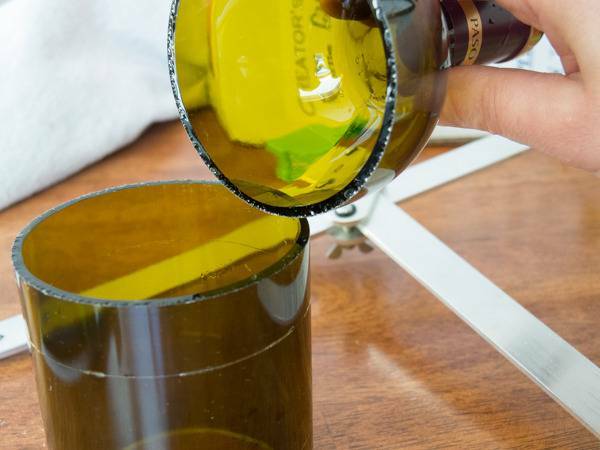 CRL Professional Glass Cutter Oil is an ideal lubricant for making clean cuts. Honestly, when I took this little thing out the box, I wasn't terribly impressed. Formed sheet metal and no-wing nuts? Harrumph. Although it DID have 3 cutting wheels, which was nice. Also in the box were a candle, some emory cloth, and a small bottle of sanding compound. (Interesting.) 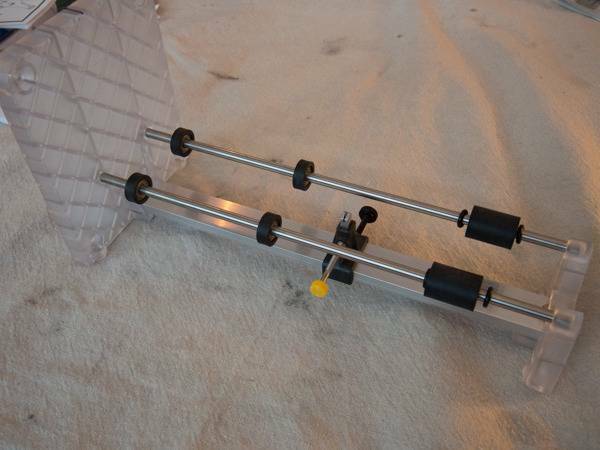 Two of the nylon (or possibly UHMW) guide rollers and shoulder bolts were not attached to the unit. Since there were no assembly instructions, they could have been overlooked before shipment or perhaps they came apart in shipping. No matter, as it was quite obvious where they went. And, will wonders never cease, I achieved perfection on the first try with candle/cold water separation as Ephrem's suggested! So why success on the first attempt?? I think it might have to do with the squatty nature of the Ephrem's. 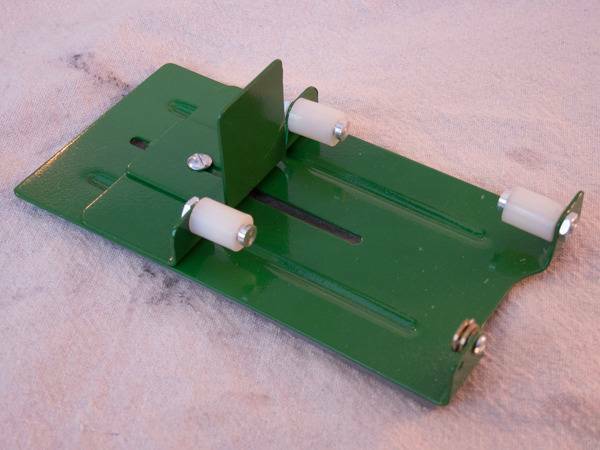 The fact that it's made out of compact, formed sheet metal and there are no wing-nuts to make room for, it can sit close to the ground which means it has really good stability. As far as cutting on a slant? 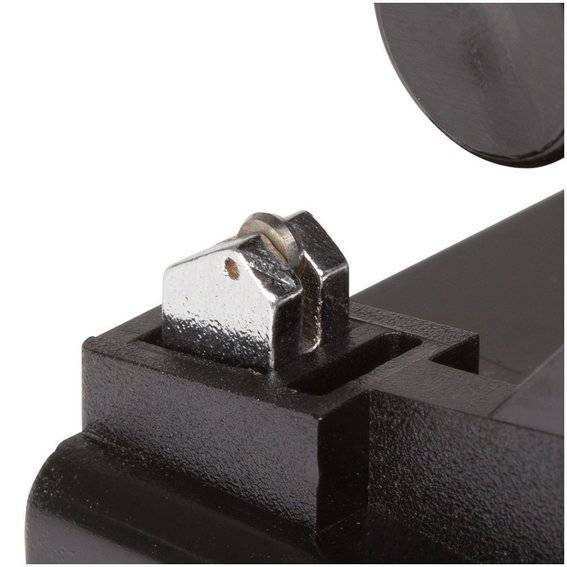 The maker offers an adapter on their website for $6 to make such cuts. 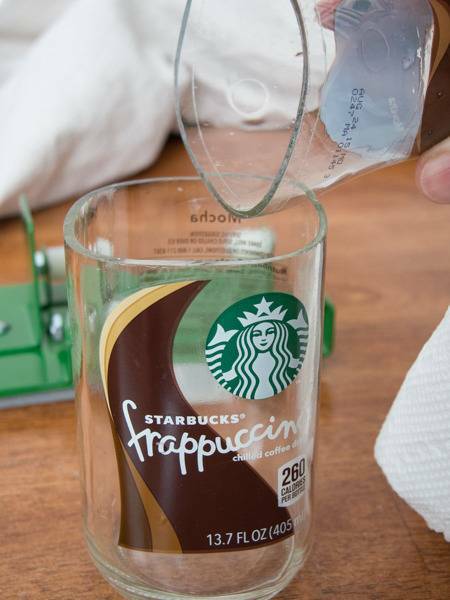 Then, just for fun, I decided to try to salvage the frappuccino bottle fail from last time using Ephrem's. Again, perfection! Opening its box was a joy. NO assembly! As for my first impressions of the unit itself, it was obvious that a lot of thought had gone into its design and construction. This is what a 100 dollar bottle cutter gets you: injected molded ends with honeycomb for rigidity, 1/4" steel shafting, rubber-coated steel ball bearings, an aluminum backbone with integrated ruler, and very 'grippy' silicone feet. Oh, and a mark on the top of the backstop so you can gauge when your bottle has made a 360 degree rotation. (Very thoughtful.) It also comes with 2 rubber rings, which you'll see later, to direct hot and cold water for hot and cold water separation. Included is also a nylon (or possibly UHMW) and foam pad to protect your palm. Basically, you're supposed to put the pad, nylon side down, on the bottle, and place your palm on the foam. 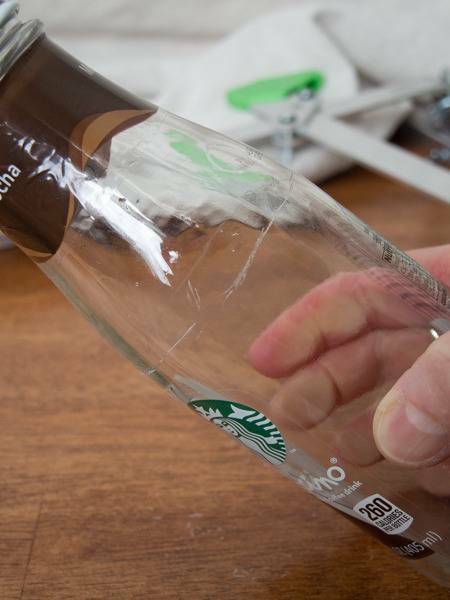 This makes the bottle slip easily as you hold it in place. 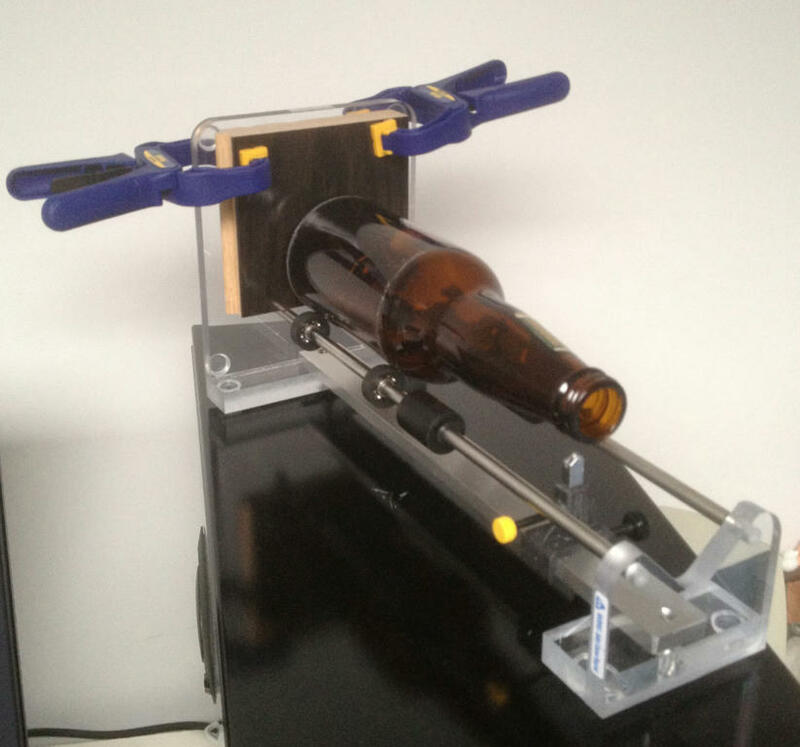 Another thing to note is that the Creator's cutter itself is spring loaded, so it is pushing up on the bottle as you rotate it--you don't push down, more like just hold it in place. This feels a little weird at first, but only after using other bottle cutters. 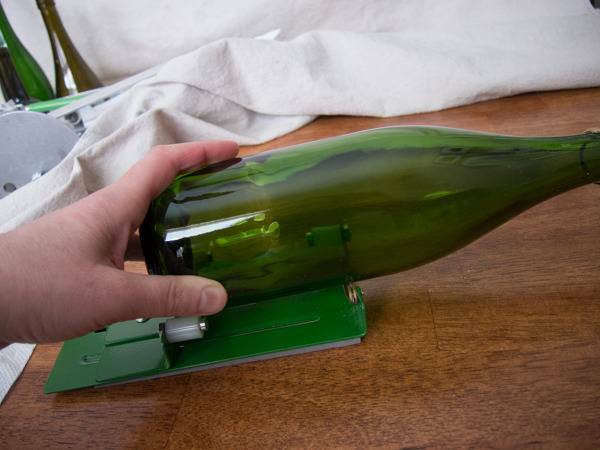 If you're new to bottle cutting, it wouldn't be an issue. I tried making two different scores at two different lengths on the bottle picture above, but the lines went all wonky. I think it was the nylon pad that did it. Yes, it makes the bottle slip easily as you hold the bottle in place, but it also means the bottle might slip away from the backstop. If that happens, you won't get an even cut. I didn't even attempt a separation with that bottle, so I tried another, this time nixing the nylon pad thing. That score was much better. This time I used the hot/cold water method and the two rubber rings that I mentioned earlier to guide the hot/cold water along the score line. 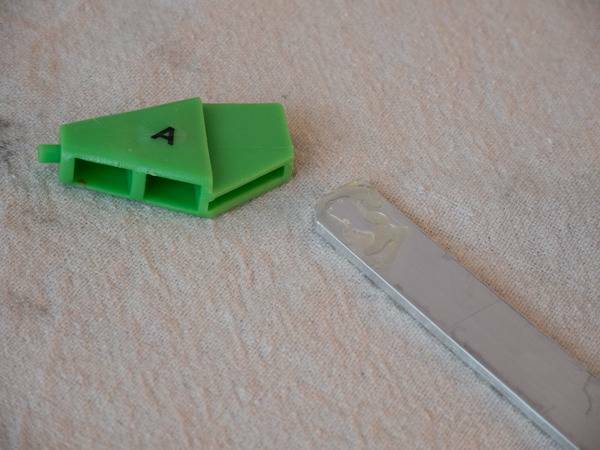 This replacement cutter wheel for the Creator's Bottle Cutter is good to have just in case. Once you get the hang of it though, it's fairly easy to get an even score line. 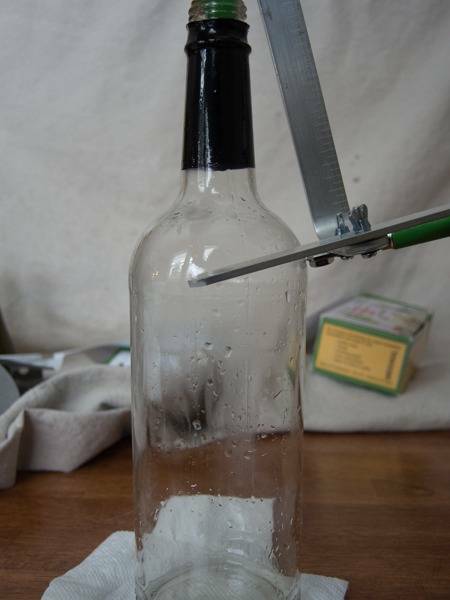 However, if you plan to cut even a slightly square bottle or jar, like the one below, forget about it. The cutter gets hung up on the angles and won't spin. 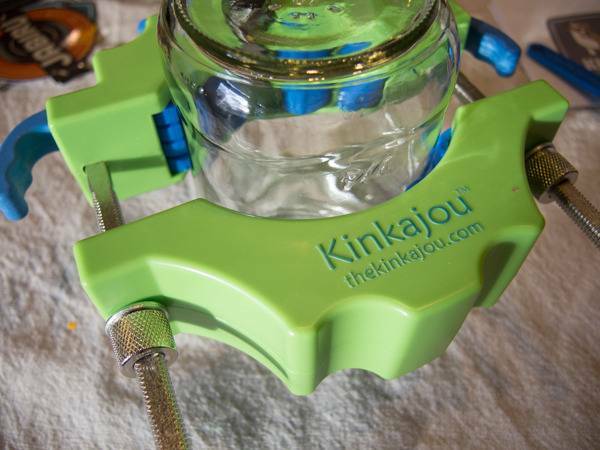 There are things I do like about the Kinkajou. Its construction allows for easy visibility of the cutting wheel, which is great. 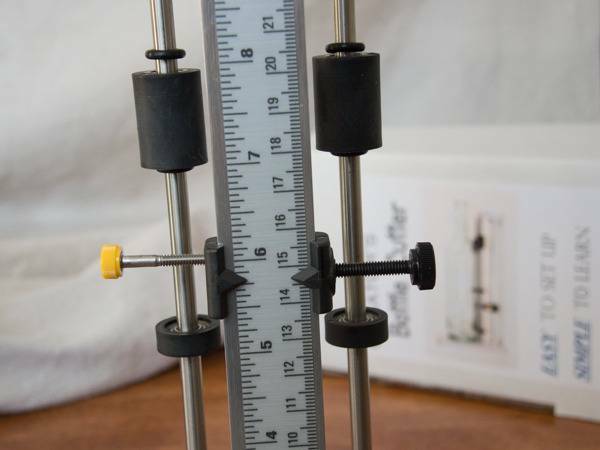 I also like the pliability of the separation rings, which are much stretchier and therefore easier to use than those that accompany The Creator's. But.....that's about it, I'm afraid. I just can't get over the torque issue. It's too unpredictable for me. And then there's the whole 'not even slightly square bottle or jar' thing. For more predictable cuts and for versatility in bottle shapes, I'd go for the Ephrem's for a bit less in price. Grade-wise, I'd give the Kinkajou a B, and that's for round bottles only. GRADE UPDATE: Murray commented how the Kinkajou won't score a level line on a slightly slanted bottle either, so for that reason, I'm going to lower my grade to a C.
The product review unit was provided by Kinkajou. All opinions are mine. Works but it might be an exercise in futility trying to maintain consistency. Again, the makers say you can cut on a slant, but that proved to be easier said than done. And as for wide-mouth jars? SUPER tricky. Unlike the other cutters in our competition, it does have gravity going for it, which means the bottom of the bottle doesn't creep up like it can on a horizontal bed. For an occasional, straight-forward WINE bottle score, it'll do the job. Although frustrating, it did, eventually, make a nice score. Ultimately, I could see the price making up for the frustration to the user. I'm giving the G2 a wobbly C- for wine bottles only. (And because that part fell off.) 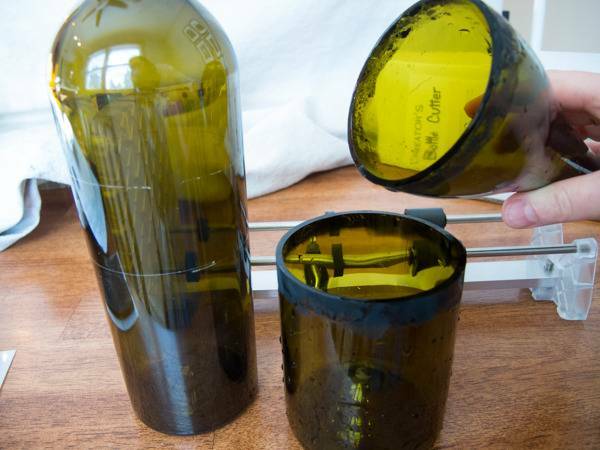 For wider-mouth bottles and jars, I'll give it a D, only because there's probably a way to get a successful score if you have a lot of time and patience. 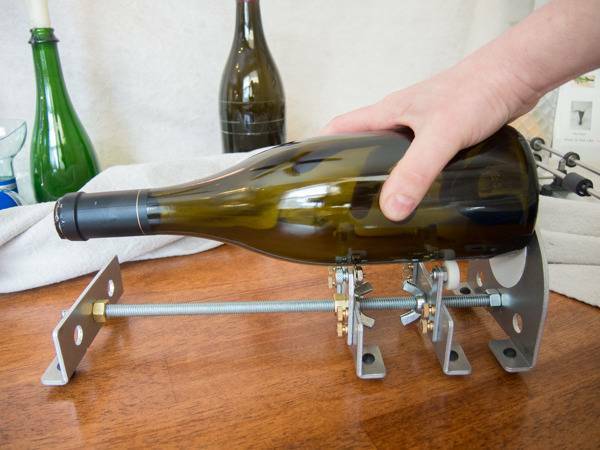 A respectable, well-made bottle cutter that does the job nicely. Because the makers have disappeared and have, possibly, gone out of business, the cutter will only be found secondhand, which may mean a discount from its original $50 price tag. If so, I'd buy it. As for a grade, I'd give it a B if the company were still in business. Because they're not, it might be best to do the pass/fail route. In this case: PASS. Once you get the hang of it, I feel it will be the most consistent in cutting lengths of all the products in this shootout. The integrated ruler on the back will get precise measurements for your cut lengths, and is a necessity if you plan to cut RINGS. Downsides of the unit are 1. it only comes with one cutting wheel and 2. it doesn't cut on a slant. The wheels are replaceable, of course, but for the slant--there isn't an adder for that. However, Creator's offers a bottle 'neck cutter' for $50 that looks rather enticing. 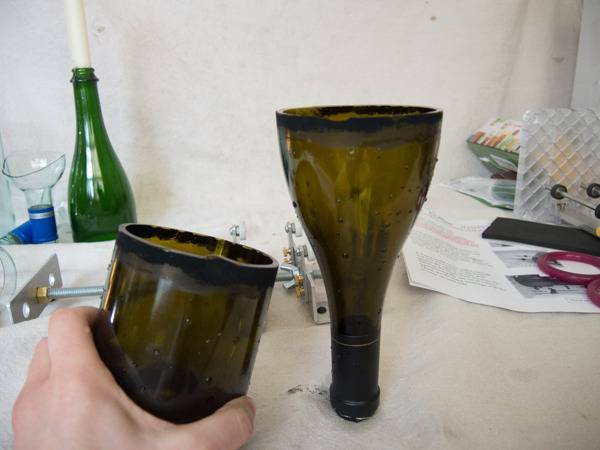 Ultimately, I'd suggest the Creator's for for those of you who intend to start a cottage industry involving bottle-cutting. For a grade, Creator's gets an A. 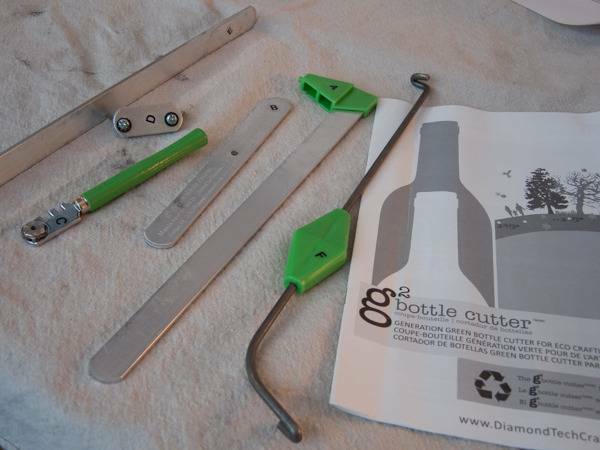 None of the retailers of these bottle cutters supplied products for this review. It was entirely funded by Curbly. As for the opinions of the products, those are mine and mine alone. If anyone has any further questions about the individual products reviewed, I'll do my best to answer them for you. Just ask in the comments below.